How to Control your Shih Tzu’s Fear Biting and Excessive Barking? You love your pet, but sometimes, his behaviors can really be frustrating. Excessive barking is just one of those negative behaviors that can be a headache. With some dogs, it doesn't take much to set them off, and they can proceed to bark for minutes or hours. If you're not home, the problem can be even worse - disturbing your neighbors or others in the household. Of course, you want your dog to alert you to when there is a potentially dangerous situation. However, barking all of the time can be disturbing and stressful. As the owner, you must know when to stop or control them. You can begin by calmly telling them to stop. If they do, you need to make sure to praise them so that they can begin to distinguish when barking is acceptable. It's important that you train your dog as soon as possible on when it is acceptable to bark. When you first begin training, it’s best to use rewards. However, there may be times that your dog is barking and is unwilling to listen to you. In these cases, you can use a water bottle or noise maker to capture their attention. You don't even have to spend money on a noise maker - you can make your own by placing items such as beans or popcorn kernals in a can, then seal the can. 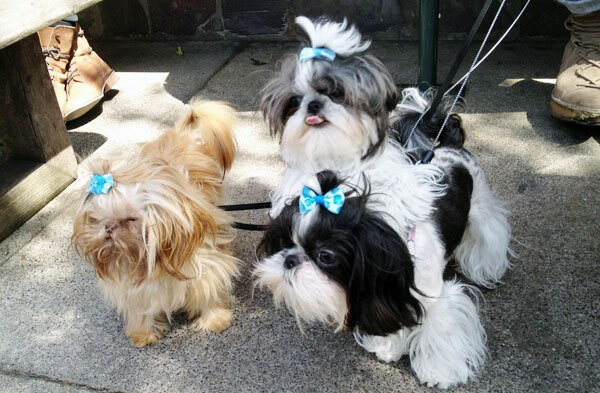 Furthermore, there are some Shih Tzus who have the negative habit of “whining” once left alone. To keep this down or eliminate such attitude, there’s an effective training method you can use. You can start walking or playing fetch to distract your pet, with the added bonus of giving your pet exercise for its health. Giving your pet sufficient exercise can eliminate some very common behavioral issues, such as whining or barking. A half-mile walk should be sufficient. Make sure that you are in control and don't let your dog dictate your activities based on its bad behavior. You need to be more firm, instructional, and loving and act as a good teacher or leader during your training. Humans need to know how to act accordingly and how to avoid startling a dog, whether its actions by the owner or a visitor to the home. Shih Tzus can be started by loud talking or noises, or even by seeing something unfamiliar, like a person wearing a hat. Once they get familiar to something strange, they will easily loosen up and appreciate people and other dogs around them. Excessive barking, if not addressed, may lead to even worse behaviors, such as biting. This is common in small dos that feel frightened or fearful. This behavior can be avoided by training your dog to not bark or overreact in a variety of situations. It's very important to socialize your Shih Tzu so that he or she becomes familiar with many different people and animals.